Kind of dissapointed. Out of the three reels i bought last year for ice fishings all of them have problems now. A mitchell, shakespeare, and a scheels outfitter. Werent really that cheap either paid close to 25$ for each one. Started making a annoying clicking sound and wont stop. I wasnt that hard on them this year either. Just wondering what you guys prefer for your ice reels. I like using ultralites. Have been looking at some okumas and abus. I really Like the Sedona 500 for a lot of my ice fishing but do have several Okuma that I like a lot. i am looking at purchasing a abu cardinal series reel for this winter. they seem really decent and are only around $30. i know other people that have been satisfied with them as well. hope this helps you out a bit. Pinnacle micro ice are my favorite. They seem lighter than Gander Mt. 's ultralight & Abu's - both of which are nice too. ivegottabite, My girlfriend with help from my dad bought me the cardinal 100u for christmas last year. I love the thing so much I bought a 5'ultra lite for summer fishing to put it on for crappies. Best real and the Gander mountain Micro 3 is good also for under $30. I wouldn't call them cheap but I got a couple little Shimano Spirex reals on my ice rods. They are very crisp and smooth. I plan on adding a couple more this winter. The one has landed me a 18lb Pike so they can handle about anything that swims under the ice. I pretty much use Tica for all my ice reels. I haven't had any problems with one yet. Drag is fantastic and very smooth. Functions just fine in cold weather too. I also like Tiny-20s and Cardinals by Abu Garcia. Browning made a nice ultra-lite but I can't find it anymore. Quantum has a few too. A lot of choices out there. I two major disappointments with my reels last year, both drag failures. At the point where the drag needed to yield line instead it spun up and lost all tension, and I lost fish both time. Both were reels that came with the combos. I've fished with light tackle a lot and I'm pretty sure this wasn't pilot error. Anybody else have similar issues? I'll second the Silstar Tiny-20! I picked one up last week - it was only $17, and it's a great reel! Definitely the smallest, lightest I've found, with a good drag and three ball bearings. No instant anti-reverse, but it has a multi-point reverse that's still very good. I also have quantum, spidercast, okuma Avenger 15's, and a Gander Mountain ultralight that is very nice. The Okumas are a little heavy for panfish rods, I have them on walleye rigs. I use Fin-Nor reels and can't say enough good things about them. I have had one that has been on ice and open water duty for six years and still is as smooth as the day I got it. They cost a little more, but I have gone through three abu garcia tournament reels, and a couple shimanos in the time that I have had the Fin-Nor. The Ticas are very nice. I burned one out after two seasons on ice. I was kinda disappointed. It was the $50 model too not the cheaper one. I bought some $15 Gander MT made by Pinnacle and they are decent. And for a third of the price, they only have to last one season to be better than the Ticas. You cant beat the tica cetus, for reels, i will second mj's notion. Yes the Tica Cetus is nice but I also have seen 3 of them die. All 3 happeneed to be on LOW. Is the triangle moving north from RED? I have had no problems with the 3 I have though and they are almost too smooth if there is such a thing. I have to have anti reverse on my reels. I cant stand any play in them so I got rid of my Spirex's but if you dont mind that play than its another great choice. Like Matt said there are a lot of good small ice reels out there. I think it just depends on how much $ you want to fork out. Matt those JR'S tackle combos you had last year sure looked sweat! Yep, the JR's ultra-lites are nice, but keep an eye out for the new ones coming sometime in the future, they are sweet! I've done pretty good with the JR's ultra-lites for panfish, but I haven't tangled with too many big fish with them yet to get any real feedback on how well the drag performs after taking a beating. T2's and Tiny 20's for pannies. I like the Sedona 500's for 'eyes and Pinnacle Deadbolts for lakers and pike. Shimano is offering a new size in many of thier line.. its a 750.. between a 500 and a 100 series... should be great for you walleye guys... they also will have in infi anti reverse. 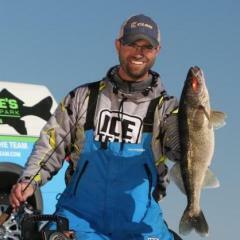 Look for shimano to make some huge changes to meet the needs of ice anglers in the next couple of years. Matt I may be at JR"S with BDR on Friday. Can you make it? Drop me a e-mail I would like to catch up with ya while Im down your way. I'm in Mankato right now and I'm leaving for Rainy Lake on friday so I can't make it this time. I stopped in there last friday. Let me know the next time you are down and we'll get together. I will have to agree with everyone on the Tica Cetus reels. All I can say is smoooooth and no slop (Istant Anti-Reverse)in a ultra light reel. The Libra 2500 reel from Tica is another good reel but the size is on the larger size. 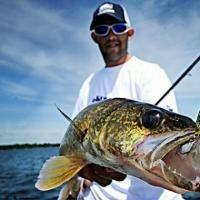 It's perfect for jigging for lakers and pike. Picking out a reel for icefishing didn't used to be so hard. Yikes. Cabela's didn't have any more Spirex which have treated me very well. I was looking for something in the $50 range and there are definitely some nice options. Thought hard between the Tica & the Sedona, they also had the 750 size Shimano Exudedude mentioned earlier. Very nice reel but I was looking for something a little smaller. I ended up taking home a Tica. I definitly like the instant anti-reverse and the single paddle handle compared to the double handle on my Spirex reals. Now I have to find another Thorne Bros rod to match it up with. Couple of the sales guys must have thought I was nuts. Got a basket full of icefishing stuff and it is only October. I was probably the first person who was poking my head into the ice houses. For all you Red Lake, LOW guys- They have auger extensions in stock! Don't wait til the end of February!! Cabela's finaly has there ice fishing stuff out???? Yehaw, I know where I'll be in the morning. I use mostly tiny 20's for panfish and abu garcia cardinals, and gander mountain reels for my deadstick rods and walleye rods. I use a ultra lite real by TICA. I love it, it has a anti reverse it held up in the cold. It is a great real. I bought it at gander mountain. I am also a die hard tica user. I bought one last year from Thorne Bros. I bought a new rod and asked what they recommended they asked if I had ever heard of these. I said I hadn't and was a little skeptical but I got one. Within a week I had 2 more and I just bought 2 more now. So I have tica's on all my thorne bros rods. I also have a Sedona 500 but I don't like it as well the handle seems to short for me it seems like I can't catch up when reeling. I also have used quantums/browning and they pretty decent. I got a shakespear synergy combo a couple years ago great reel but the rod broke about my second time our. I just bought my buddy a new Abu for his birthday it seems pretty nice I guess he will find out.